We had a power outage and my emergency lights came on, but after an hour or so they stopped working, why? 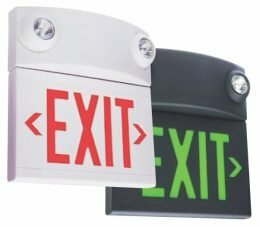 I can get Exit Signs and Emergency Lights from online vendors. Why should I buy from Fox Valley Fire & Safety? Why can’t I inspect the Emergency and Exit Lights myself? What are some of the common issues found during an inspection? My Emergency Lights have last year on the inspection sticker, am I overdue for an inspection? New stickers were applied to all of my units except for one, did the technician miss this one? 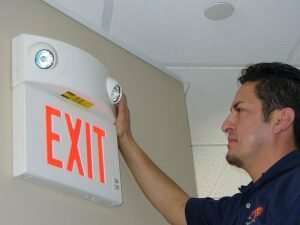 Are inspections of emergency lighting required? What is a Central Lighting Inverter System? The purpose of Emergency and Exit Lighting is to assist in the egress of the building. Per NFPA 101 code the battery backup must power the Emergency and Exit Lighting for 1-1/2 hours or 90 minutes which allows time for occupants to leave safely. If a unit turns off before 90 minutes has passed then the battery may be too weak or the unit may need repair. Once A.C. power is restored your emergency and exit lights will recharge the batteries automatically. But it will take approximately 24 hours to recharge the unit to full capacity. Codes: The City of Chicago requires Chicago rated metal and glass units and AHJs (Authority Having Jurisdiction) in some suburbs require green exit signs. In your effort to save money you may make a costly mistake. Our technicians and safety experts have decades of experience, servicing, inspecting, repairing and installing units. When Fox Valley Fire & Safety provides and installs units, we warranty our work and all parts. Saving money on inspections is tempting but may end up costing you many times more in the long run. NFPA 101 code requires batteries to pass a load test to insure they are capable of powering the unit for 90 minutes. A simple push button test does not meet all code requirements. Our factory trained technicians thoroughly inspect and test each unit. Batteries are weak or may fail entirely or they may be found to not perform up to code and need to be replaced. A bulb may need to be replaced. The unit may no longer function properly and may need to be replaced. The year listed on the sticker along with the month punched represents the last inspection. The technician also notes their initials and date on the sticker. In most cases your next inspection is not due until one year from that date. Exceptions to this are some movie theaters, Nursing Homes and Facilities under IDPH Jurisdiction, which may require semi-annual or quarterly inspections. If an issue is found during inspection, and the technician does not have the repair part or the approval to make the repair, he will not adhere a new inspection sticker indicating this unit passed inspection. As soon as the unit is repaired or replaced and passes inspection, a new sticker will be applied. Yes, per NFPA 101 – Life Safety Code, Section 7.9.3 addresses the NFPA’s requirements for periodic testing of emergency lighting equipment. It requires both a monthly 30 second minimum activation test, and an annual test where the lights are activated for 1.5-hours. Written records of the monthly and annual tests must be maintained for inspection by the AHJ. NFPA is the standard requirement, some AHJ’s, such as the Chicago Municipal Code, have additional requirements. A central lighting inverter system (also called a UPS or Uninterruptible Power Supply) is a battery back-up system. During a power failure it converts your light fixtures into code-compliant emergency lighting. Inverter systems are made up of a set of DC batteries and electronics that can convert the DC power from the batteries into an AC power source needed for the emergency lighting loads. The lighting does not go out when the power is converted from battery to AC power, this provides illumination for the designated path of egress under emergency conditions, allowing safe evacuation of the building.